Modern design, optimal water consumption, energy saving, convenient user friendly programs and functions, flexible interior design - this is all what is needed when buying realiable and durable free standing or built in dishwasher. Programs: logical variety of programs meeting different cunsomer needs. Automatic when sensors detect the soil level and automatically determines appropriate program, hygienic for washing babies utensils, economic and a lot of other programs. Steam technology: dishes are dried very effectively without loosing their brightness. 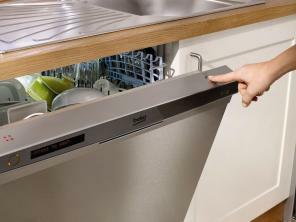 One button technology: all is needed just to place dishes into the dishwasher as required, the rest will be done by pressing one button. Half load: there's no need to wait for boath racks to be fully loaded. It is possible to load the upper, the lower or both racks together as required for easy and economical washing. Third upper basket: perfect fits for placing small kitchen cutlery and effective washing. Flexibility: adjustable height of the upper basket, sliding cutlery basket, easy fold plates support, adjustable shelves for mugs. Antibacterial features: self cleaning filter and antibacterial seal which prevents from accumulation and reproduction of bacteria. Overflow safety: in case of overflow, the system automatically stops supply of the water. 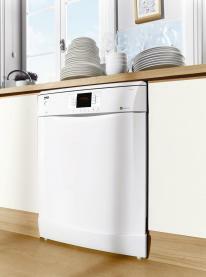 Inverter motor: durable motor technology that also ensures quiter operation of the dishwasher.